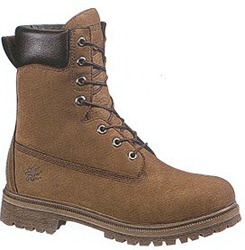 BOOT: NUBUCK LEATHER UPPER. DIRECT ATTACH CONSTRUCTION. REMOVABLE FULL CUSHION COMPRESSION MOLDED FOOTBED. POLYURETHANE MIDSOLE. 200 GRAM THINSULATE INSULATION. BREATHABLE FABRIC LINING.